"All too often, it seems that publications related to manufacturing productivity focus on short-term fixes in 'easy' scenarios. This book is unique in that it addresses improvement projects that cover the full planning range from a temporal perspective, and the pursuit of excellence regardless of product life cycles. It is key that the concepts presented in the book consider short-, medium-, and long-term productivity in a way that precludes the tendency to focus on short-term fixes. It is perhaps also this approach that leads to the development of strategies that can be used even during times of economic contraction. In short, this book provides the tools required to manage manufacturing organizations and maximize profitability during both good and trying times." "This book provides a way to improve practical approach and tools for competitive target costs setting with a goal engineering approach at first and unfold it for a whole organization about cost management and cost reduction, using both growth and reduction sales scenarios." "Effective cost management underpins the achievement of competitive manufacturing, and increasingly manufacturing strategy is dominated by the need to reduce operating costs. Firms that arbitrarily cut costs to satisfy short-term profitability goals miss the bigger opportunity to both reduce costs and increase productivity. This is where Alin’s book makes an important and unique contribution, bridging the strategic management and operations improvement domains. Through MCPD decision makers are better informed to identify cost reduction opportunities, which can then be implemented through productivity improvement. To put it simply, MCPD makes manufacturing better: cheaper, more productive, and more capable of competing on a global scale." 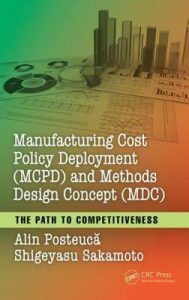 "I’ve been collaborating with Alin since a long period already for different projects, and I have been witness to the development of the Manufacturing Cost Policy Deployment (MCPD) concept at different stages until this third book on MCPD has been reached. 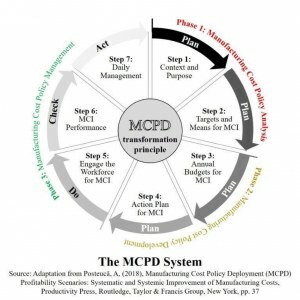 The MPCD system is a unique reference concept in an operational environment to drive productivity improvements in order to achieve the operating profit goal through manufacturing cost improvement. Using the MPCD system, it is easy to identify and continually reduce the manufacturing costs associated with losses and waste across each product family processes. Also, cases study are very useful to understand how this new concept can be translated into practice, some of them developed in our factory, so you just need to get it done!" "Written by a seasoned professional Ph.D., the book of Alin Posteuca is a mind opening a new way of scientifically and practically approach the concepts of manufacturing operations. Want to make your business more profitable, you the present days entrepreneur? Do you want to get immersed in the wonderful philosophy of productivity, get to know the latest ideas that the experts are conveying them to the production floor? Alin’s book is an answer and a practical guide to all these. It shows the basic fundamental and scientific steps and factors that are supporting his new very original approach to the profitability and productivity and also practical suggestions when facing problems on the production floor." 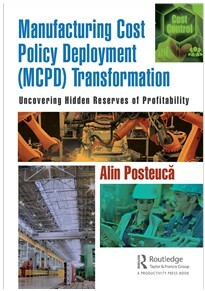 "While most of authors are focusing their efforts, experience and explanation on productivity improvement, Alin, with his ``Manufacturing Cost Policy Deployment`` (MCPD) goes further- providing real improvement factors, continuous targeting of improvements to profit, financial quantification of results - all elements needed in order get the results of improved productivity at the level of profit and loss statement (P&L). 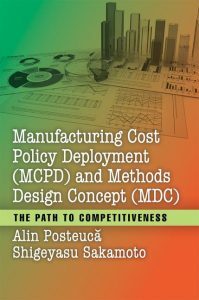 This third book dedicated to MCPD, named ``Manufacturing Cost Policy Deployment (MCPD) Profitability Scenarios: Systematic and Systemic Improvement of Manufacturing Costs`` is ``advanced level manual``: 15 improvement projects documenting previously explained scenarios, concise, clear, targeted and obviously easy to replicate to meet the Manufacturing Cost Improvement (MCI) goal - you CANNOT pretend haven't found your company's situation in one of those." 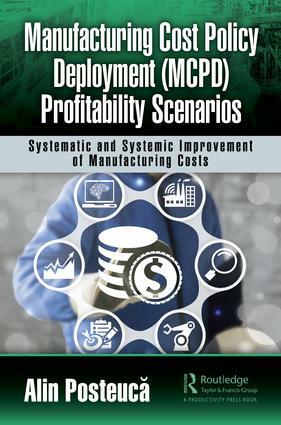 "This book demonstrates how MCPD system is helping companies with different type of production environments, to focus their improvement strategies and transformation of product families flow to meet customer demand, continuously targeting Manufacturing Cost Improvement convergent to zero Cost of Losses and Waste and continuous profitability improvement. Readers will find different scenarios of MCPD implementation that show impressive easy to replicate results (i.e. to meet the annual MCI goal, an kaizen project for MCI achieved profitability targets by reducing the set-up time by 70% and another by reducing breakdown by 35% to increase OEE level)." "In this new book on the MCPD system, starting from the basic questions of any manager (such as what are the activities that generate losses and waste, what types of losses and waste occur and how they are generated along the manufacturing flow, which processes are in the top of the ones that generate most of the costs of losses and waste (CLW) and what is their trend etc.) the systematic and systemic activities are presented, both annual and multiannual, for identification, quantification and analysis of CLW to consistently achieve manufacturing cost improvement (MCI) targets. The surprising and documented context is valid in the vast majority of manufacturing companies. The potential for approaching and improving the CLW of 30-50% is enormous and represents the path to true competitiveness through costs. The 7 presented matrixes are intuitive and can be easily used for any practical model, and based on them (using the PDCA cycle), real data are available to achieve annual MCI targets. Also, it is very well underlined the way to set the annual MCI means targets (``what how/through what leverage``) taking into account the current and future context of the market & sales. Clearly, it is a book that can be applied in factories to reduce costs consistently and strategically. I recommend the MCPD system and this book to those who realize or not that they are on a mountain of losses and waste and also have the necessity, ambition and leverage needed to radically improve this current status!" "Since I as child I’ve loved nature. Why? Because it knew how to deal with changes to find simple solutions to complex problems. In our industrial era we have simple problems and we try to find complex solutions. In the same way Manufacturing Cost Policy Deployment (MCPD) Profitability Scenarios: Systematic and Systemic Improvement of Manufacturing Costs book by Alin Posteuca shows us the nature way. Not only by theoretical but also by practical example. Doing Lean more than 15 years I’ve learnt what is the ``KISS`` – ``Keep It Simple Stupid``. In the same way the book written by Alin teaches us how to survive and make profit in a very competitive market."